Do I have to do rescue breaths when doing CPR? Why don’t we check for a pulse? 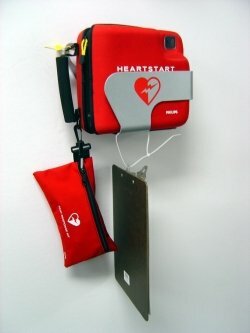 What is a defibrillator / AED and how does it work? How many people survive a cardiac arrest? What is Cardiopulmonary Resuscitation? (CPR) What is CPR? CPR, the kiss of life, resuscitation, heart massage. These are all words used for Cardiopulmonary Resuscitation (CPR) by the media and general public. These terms can lead to confusion around CPR and what it actually is. So what is CPR? How does it work? Can I do CPR? Do I need to attend a CPR class? Read on to find the answers, you could learn how to save someone’s life by answering the question – what is CPR? Looking for free online first aid training or first aid presentations? All the cells in your body require oxygen to survive. They also require a good supply of nutrients and the rapid removal of waste products. Oxygen and nutrients are carried around the body in your blood, which is pumped by your heart. In your lungs, oxygen enters your blood stream and carbon dioxide (a waste product) is removed in a process known as gas exchange. If a cardiac arrest occurs, blood will stop circulating around the body. Breathing will also cease as well though it may not stop completely for several minutes. Without a supply of oxygen, the cells in the body start to die. Brain cells are incredibly sensitive, after about 4 – 5 minutes of no oxygen brain cells will begin dying leading to brain damage and death. The purpose of CPR is to keep oxygenated blood flowing around the body to keep the vital organs alive. 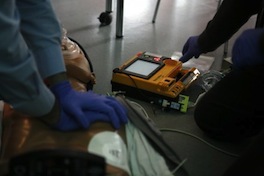 CPR itself will not restart someone’s heart, it just keeps them alive until a defibrillator arrives. A defibrillator is a device which delivers an electrical shock to the heart to restart it. How can I help someone who has collapsed? Danger: Check for any dangers to yourself. Response: Check for a response from the casualty. Shout and gently shake them on the shoulders. Compressions: If the casualty is not breathing, you should call an ambulance and start chest compressions. Once you’ve found someone isn’t breathing , you should start CPR by administering 30 chest compressions. Interlock your hands and place them in the middle of the person’s chest and push down 30 times. You should aim for a depth equal to a third the depth of their chest. You do not need to check for a pulse, as this often wastes valuable time. If a public defibrillator is available, then it should be sent for. After 30 chest compressions, you should give 2 rescue breaths. Tilt the casualty’s head backwards, make a seal over their mouth and breath in twice. Each breath should only last about one second so as not to over inflate their lungs. You should aim for a rate of 100 – 120 chest compressions a minute. Remember you don’t need to have undertaken formal first aid training in order to perform CPR! Unfortunately this is very unlikely to happen. By doing chest compressions, you are taking over the job of the casualty’s heart (which has stopped) by forcibly compressing it. In effect, you are acting as a life-support machine for the person. In order for the heart to be restarted, it may require an electrical shock from a defibrillator or drugs given by a paramedic/doctor. CPR on its own is very unlikely to restart someone’s heart. However, good quality chest compressions will significantly increases the chance of the defibrillator being able to restart the heart. The casualty shows signs of life: coughing, breathing etc. Ideally, you should only carry out CPR for a couple of minutes before swapping with someone else. This is to ensure that the chest compressions remain of good quality. If the casualty does start breathing, you should place them on their side. This will prevent the tongue from blocking their airway, and stop any vomit from traveling into their lungs. Why should I learn first aid? First aid training is incredibly important, each year thousands of people suffer accidents & illnesses which are treatable with basic first aid. I’d recommend anyone reading this page to take an online CPR or first aid class. 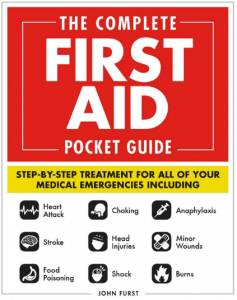 In the UK, the three large first aid charities (British Red Cross, St John Ambulance, St Andrew’s First Aid) provide first aid training on a regular basis. In the US, the American Red Cross runs first aid and CPR/AED courses for the general public. We believe everyone should have access to reliable and accurate CPR information. First aid saves lives - but not everyone has the opportunity to attend a first aid course. What is CPR? © 2019. All Rights Reserved.